This swoon worthy iPhone case review has been brought to you by Shutterfly. All opinions are 100% my own and may differ from yours. I will only endorse companies, products and services that I believe, based on my own experiences, are worthy of endorsement. If you know me or are a regular reader here at Blog by Donna, you know how I love my gadgets, especially my iPhone. You also know how I change out my iPhone case often. Because my iPhone cases are an accessory to me. My phone has got to look good. Yes, protection is a must, too. Because I am a little clumsy with my phone… okay I’m a wee bit accident prone when it comes to my iPhone. That’s just because it’s with me All. The. Time. So it goes to figure that I may drop it from time to time. When I got an iPhone case from Shutterfly recently I fell instantly in love with it. It is my favorite iPhone case. Ever. It’s personalized with a photo of my son on it. What’s not to love about that? I’ve had so many compliments on it and people asking where I got it from…. because people love personalized iPhone cases. We love personalized anythings. Really. 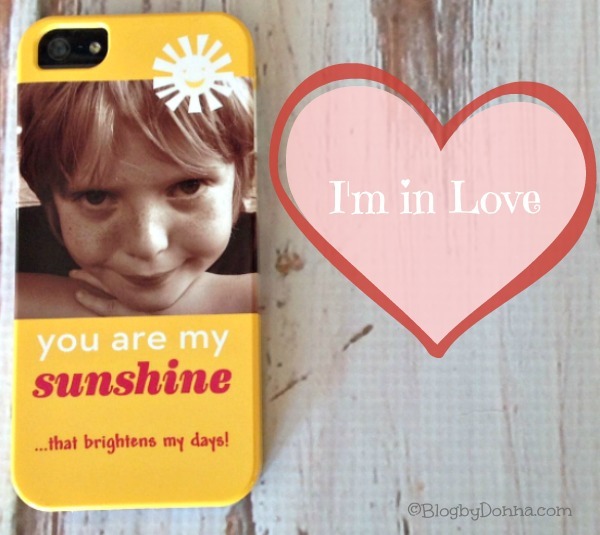 As you can see from my case above, I not only personalized it with my son’s picture, but I chose a case that said something meaningful — “you are my sunshine” and then I added “that brightens my days!” Because, well… he does. My favorite thing about my new iPhone case is that even when I’m away from my son, his face is on my phone (which is always with me). It brings me some comfort. They had so many designs to choose from that I’m sure I’ll get me another one (or two) in the future, but for the time being, I’m loving my new iPhone case. I know they would make a great gift for Mother’s Day, Father’s Day, or a graduation gift. How would you personalize your iPhone case? What a cute case! I would have to put my three girls. Love it! I have a personalized phone case as well, it has my three children on it and I love it! I’m like you I love personalizing everything! I’d love to put a picture of my kids! That is so sweet. I don’t have a decorative case, just a simple one to keep my phone from breaking when I drop it a million times a day. So cute! I wish I could get a custom one for mine, but we have droids. oh so cute! I love the personalized iphone case. What a great way to bring a family pic with you all the time. That’s adorable – this would be a great gift idea! That’s a sweet case. I would probably put pictures of my kids on mine. So cute! I’d love one with my kids on it. Or maybe my horse! What an adorable phone case. I don’t have a pretty case but seeing yours makes me want one now. That turned out great! I’d love to get one made with my blog logo. I’ll need to check if Shutterfly offers these cases for other phone models. I want one!! Aww what a cutie, he definitely makes your phone one of a kind! Aw, how sweet! I would definitely put my kids on mine. Too adorable!! I’d love one with my son’s picture on it!! It’s no secret I looooove Shutterfly! This is one of the only products I havent made. I’d love to though. How durable is it? I really love that case. I need to get one similar. I saw this in my facebook feed and its really great! I love that you can take your kids, pets, spouse, etc and show them off to the world. I have a bag like this that is customized and its my favorite and I get compliments constantly. How sweet! I can just imagine what a great Mother’s Day gift a photo case would make. I would definitely put pics of my kids on it! Super cute. That is seriously so cute! I love the picture and design, what a perfect case!!!! Nope. I just have my Ottercase. I just spent over $70 for a custom case and the colors are starting to fade but I love the looks of this one, too cute! That is so cute. I would love to have one made up with a photo of my boys on it. Aww that case is so adorable! Loving the yellow! That is such a cute phone case- I love personalized cases!